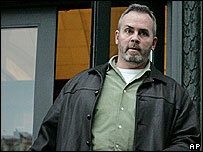 Richard Hatch, the first winner of US reality TV show Survivor, has been convicted of not paying taxes on his $1m prize. A jury also found him guilty of evading taxes on rental and employment income, but cleared him of seven other charges. He now faces up to 13 years in prison and a fine of $600,000 (£336,000). Mr Hatch shot to fame as one of 16 contestants marooned on a Malaysian island for the show which sparked a reality TV boom in the US. During the trial, Mr Hatch had told the court that he thought the show's producers would be paying the tax on his prize money. His lawyer also said Mr Hatch was a bumbling bookkeeper who could not handle so much money. But the jury in Providence, Rhode Island, found him guilty of failing to pay taxes on his prize money, rental income from a property he owned and employment income which he earned as a co-host of a Boston radio programme. He was acquitted of seven other charges, including bank fraud. Mr Hatch was taken into custody after the judge said he was a potential flight risk. The finale of the first series of Survivor attracted over 50 million viewers. Subsequent series have continued to attract viewers in the US.